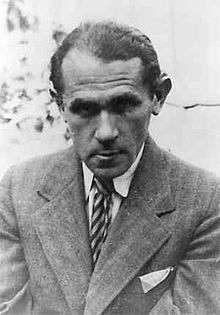 Bruno Schulz (July 12, 1892 – November 19, 1942) was a Polish writer, fine artist, literary critic and art teacher born to Jewish parents. He is regarded as one of the great Polish-language prose stylists of the 20th century. In 1938, he was awarded the Polish Academy of Literature's prestigious Golden Laurel award. Several of Schulz's works were lost in the Holocaust, including short stories from the early 1940s and his final, unfinished novel The Messiah. Schulz was shot and killed by a German Nazi in 1942 while walking back home toward Drohobycz Ghetto with a loaf of bread. Schulz was born in Drohobych, Austrian Galicia, historically part of the Kingdom of Poland before the three partitions, and today part of Ukraine. After World War One, Drohobycz became part of the Lwów Voivodeship. Bruno Schulz was the son of cloth merchant Jakub Schulz and Henrietta née Kuhmerker. At a very early age, he developed an interest in the arts. He attended school in Drohobych from 1902 to 1910, after which he studied architecture at Lviv Polytechnic. His studies were interrupted by illness in 1911 but he resumed them in 1913 after two years of convalescence. In 1917 he briefly studied architecture in Vienna. At the end of World War I, when he was 26, Drohobycz became part of the newly reborn Polish Second Republic. Schulz taught drawing in a Polish school from 1924 to 1941. His employment kept him in his hometown, although he disliked the teaching, apparently maintaining his job only because it was his sole source of income. Schulz developed his extraordinary imagination in a swarm of identities and nationalities: he was a Jew who thought and wrote in Polish, was fluent in German, immersed in Jewish culture, yet unfamiliar with the Yiddish language. He drew inspiration from specific local and ethnic sources, looking inward and close to home rather than to the world at large. Avoiding travel, he preferred to remain in his provincial hometown, which over the course of his life belonged to or was fought over by successive states: the Austro-Hungarian Empire (1792–1919); the short-lived West Ukrainian People's Republic (1919); the Second Polish Republic (1919–1939); the Soviet Ukraine from the invasion of Poland in 1939; and, during Operation Barbarossa, Nazi Germany after the German attack on the Soviet Union in 1941. His writings avoided explicit mention of world events of the time period. Schulz was discouraged by influential colleagues from publishing his first short stories. However, his aspirations were refreshed when several letters that he wrote to a friend, in which he gave highly original accounts of his solitary life and the details of the lives of his family and fellow citizens, were brought to the attention of the novelist Zofia Nałkowska. She encouraged Schulz to have them published as short fiction. They were published as The Cinnamon Shops (Sklepy Cynamonowe) in 1934. In English-speaking countries, it is most often referred to as The Street of Crocodiles, a title derived from one of its chapters. The Cinnamon Shops was followed three years later by Sanatorium Under the Sign of the Hourglass, (Sanatorium Pod Klepsydrą). The original publications were illustrated by Schulz; in later editions of his works, however, these illustrations were often left out or poorly reproduced. In 1936 he helped his fiancée, Józefina Szelińska, translate Franz Kafka's The Trial into Polish. In 1938, he was awarded the Polish Academy of Literature's prestigious Golden Laurel award. In 1939, after the Nazi and Soviet invasion of Poland in World War II, Drohobych was occupied by the Soviet Union. At the time, Schulz was known to have been working on a novel called The Messiah, but no trace of the manuscript survived his death. When the Germans launched their Operation Barbarossa against the Soviets in 1941, they forced Schultz into the newly formed Drohobycz Ghetto along with thousands of other dispossessed Jews, most of whom perished at the Belzec extermination camp before the end of 1942. A Nazi Gestapo officer, Felix Landau, however, admired Schulz's artwork and extended him protection in exchange for painting a mural in his Drohobych residence. Shortly after completing the work in 1942, Schulz was walking home through the "Aryan quarter" with a loaf of bread, when another Gestapo officer, Karl Günther. shot and killed him in revenge for Landau's having killed Günther's own "personal Jew." Subsequently, Schulz's mural was painted over and forgotten – only to be rediscovered in 2001. Schulz's body of written work is small; The Street of Crocodiles, Sanatorium Under the Sign of the Hourglass and a few other compositions that the author did not add to the first edition of his short story collection. A collection of Schulz's letters was published in Polish in 1975, entitled The Book of Letters, as well as a number of critical essays that Schulz wrote for various newspapers. Several of Schulz's works have been lost, including short stories from the early 1940s that the author had sent to be published in magazines, and his final, unfinished novel, The Messiah. Both books were featured in Penguin's series "Writers from the Other Europe" from the 1970s. Philip Roth was the general editor, and the series included authors such as Danilo Kiš, Tadeusz Borowski, Jiří Weil, and Milan Kundera among others. Schulz's work has provided the basis for two films. Wojciech Has' The Hour-Glass Sanatorium (1973) draws from a dozen of his stories and recreates the dreamlike quality of his writings. A 21-minute, stop-motion, animated 1986 film, Street of Crocodiles, by the Quay Brothers, was inspired by Schulz's writing. In 1992, an experimental theatre piece based on The Street of Crocodiles was conceived and directed by Simon McBurney and produced by Theatre de Complicite in collaboration with the National Theatre in London. A highly complex interweaving of image, movement, text, puppetry, object manipulation, naturalistic and stylised performance underscored by music from Alfred Schnittke, Vladimir Martynov drew on Schulz's stories, his letters and biography. It received six Olivier Award nominations (1992) after its initial run, and was revived four times in London in the years that followed influencing a whole generation of British theatre makers. It subsequently played to audiences and festivals all over the world such as Quebec (Prix du Festival 1994), Moscow, Munich (teatre der Welt 1994), Villnius and many other countries. It was last revived in 1998 when it played in New York (Lincoln Center Festival) and other cities in the United States, Tokyo and Australia before returning the London to play an 8-week sell out season at the Queens Theatre on Shaftesbury Avenue. It has been published by Methuen, a UK publishing house, in a collection of plays by Complicite. In 2006, as part of a site-specific series in an historic Minneapolis office building, Skewed Visions created the multimedia performance/installation The Hidden Room. Combining aspects of Schulz's life with his writings and drawings, the piece depicted the complex stories of his life through movement, imagery and highly stylized manipulation of objects and puppets. In 2007, physical theatre company Double Edge Theatre premiered a piece called Republic of Dreams, based on the life and works of Bruno Schulz. In 2008, a play based on Cinnamon Shops, directed by Frank Soehnle and performed by the Puppet Theater from Białystok, was performed at the Jewish Culture Festival in Kraków. A performance based on the writings and art of Bruno Schulz, called "From A Dream to A Dream", was created collaboratively by Hand2Mouth Theatre (Portland, Oregon) and Teatr Stacja Szamocin (Szamocin, Poland) under the direction of Luba Zarembinska between 2006–2008. The production premiered in Portland in 2008. Cynthia Ozick's 1987 novel, The Messiah of Stockholm, makes reference to Schulz's work. The story is of a Swedish man who's convinced that he's the son of Schulz, and comes into possession of what he believes to be a manuscript of Schulz's final project, The Messiah. Schulz's character appears again in Israeli novelist David Grossman's 1989 novel See Under: Love. In a chapter entitled "Bruno," the narrator imagines Schulz embarking on a phantasmagoric sea voyage rather than remaining in Drohobych to be killed. That entire novel has been described by Grossman as a tribute to Schulz. In the last chapter of Roberto Bolaño's 1996 novel, Distant Star, the narrator, Arturo B, reads from a book titled The Complete Works of Bruno Schulz in a bar while waiting to confirm the identity of a Nazi-like character, Carlos Wieder, for a detective. When Wieder appears in the bar, the words of Schulz's stories '...had taken on a monstrous character that was almost intolerable' for Arturo B. Polish writer and critic Jerzy Ficowski spent sixty years researching and uncovering the writings and drawings of Schulz. His study, Regions of the Great Heresy, was published in an English translation in 2003, containing two additional chapters to the Polish edition; one on Schulz's lost work, Messiah, the other on the rediscovery of Schulz's murals. China Miéville's 2009 novel The City & the City begins with an epigraph from John Curran Davis's translation of Schulz's The Cinnamon Shops: "Deep inside the town there open up, so to speak, double streets, doppelgänger streets, mendacious and delusive streets". In addition to directly alluding to the dual nature of the cities in Miéville's novel, the epigraph also hints at the political implications of the book, since Schulz himself was murdered for appearing in the "wrong" quarter of the city. In 2010 Jonathan Safran Foer "wrote" his "Tree of Codes" by cutting into the pages of an English language edition of Schulz' "The Street of Crocodiles" thus creating a new text. In 2011, the Austrian Band "Nebenjob" published the Song "Wer erschoss Bruno Schulz "who shot Bruno Schulz? "), a homage on the poet and accusation of the murderer, written by T.G. Huemer (see external links below). Schulz and The Street of Crocodiles are mentioned several times in 2007 novel The History of Love written by Nicole Krauss. In February 2001, Benjamin Geissler, a German documentary filmmaker, discovered the mural that Schulz had created for Landau. Polish conservation workers, who had begun the meticulous task of restoration, informed Yad Vashem, the Israeli holocaust memorial, of the findings. In May of that year representatives of Yad Vashem went to Drohobych to examine the mural. They removed five fragments of it and transported them to Jerusalem. International controversy ensued. Yad Vashem said that parts of the mural were legally purchased, but the owner of the property said that no such agreement was made, and Yad Vashem did not obtain permission from the Ukrainian Ministry of Culture despite legal requirements. The fragments left in place by Yad Vashem have since been restored and, after touring Polish museums, are now part of the collection at the Bruno Schulz Museum in Drohobych. This gesture by Yad Vashem instigated public outrage in Poland and Ukraine, where Schulz is a beloved figure. The issue reached a settlement in 2008 when Israel recognized the works as "the property and cultural wealth" of Ukraine, and Ukraine's Drohobychyna Museum agreed to let Yad Vashem keep them as a long-term loan. In February 2009, Yad Vashem opened its display of the murals to the public. ↑ Liukkonen, Petri. "Bruno Schulz". Books and Writers (kirjasto.sci.fi). Finland: Kuusankoski Public Library. Archived from the original on 10 February 2015. ↑ Wójcikowski, Grzegorz. "Rocznica urodzin i śmierci Brunona Schulza". Forum Polonijne. 3 (2007): 38. ISSN 1234-2807. ↑ Schulz, Bruno. The Street of Crocodiles. 1992, page 15. 1 2 3 4 "Who Owns Bruno Schulz? ", by Benjamin Paloff Boston Review (December 2004/January 2005). ↑ "History of Jews in Drohobycz". Virtual Shtetl. Museum of the History of Polish Jews. Retrieved 9 November 2014. ↑ Arad, Yitzhak (2009). The Holocaust in the Soviet Union. U of Nebraska Press. pp. 277, 282, 237. ISBN 080322270X. Retrieved 28 May 2014. ↑ Ficowski, Jerzy; Robertson, Theodosia S. (2004). Regions of the Great Heresy: Bruno Schulz, a Biographical Portrai. W. W. Norton & Company. p. 252. ISBN 978-0-393-32547-8. ↑ James Fiumara (November 29, 2004). "The Thirteenth Freak Month". Kinoeye. Retrieved December 9, 2010. ↑ Cooper, Alan (1996). Philip Roth and the Jews. State University of New York. p. 163. ↑ "The Street of Crocodiles". Complicite. April 19, 1999. Archived from the original on April 29, 2009. Retrieved August 27, 2009. ↑ David Grossman, See Under: Love. Trans. Betsy Rosenberg. New York: Washington Square Press, 1989. ↑ Amiram Barkat, "Yad Vashem not displaying Bruno Schulz Holocaust art", Haaretz, 06/04/05. Last accessed January 2, 2011. ↑ Bronner, Ethan (February 27, 2009). "Behind Fairy Tale Drawings, Walls Talk of Unspeakable Cruelty". The New York Times. Retrieved June 15, 2009. Petri Liukkonen. "Bruno Schulz". Books and Writers (kirjasto.sci.fi). Archived from the original on 4 July 2013. The Street of Crocodiles an animated film by the Brothers Quay. This article may be expanded with text translated from the corresponding article in the Polish Wikipedia. Adam Zagajewski. (2007) Polish Writers on Writing featuring Czeslaw Milosz. San Antonio: Trinity University Press.